This is a smaller version of a design featured in the April 5, 2013, edition of The Wall Street Journal. The one story house plan is a fashionable, timeless style that has emerged as a favorite with a growing number of Americans. 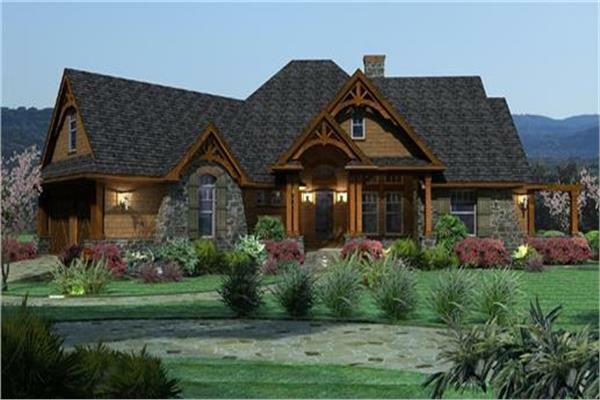 With a variety of traditional Ranch, Cape Cod, Cottage, and Craftsman options to homey Southern, Rustic Country, and charming Old World European designs, you're sure to find the right single level home for your family. The versatility, adaptability, and elegant options of one-story plans contribute to their popularity among people of all ages from coast to coast. Whether you’re looking for a luxurious space for your golden years or an affordable house for your growing family, one-story home designs offer a variety of options in terms of styles and floor plans. There are compact small homes and spacious mini-mansions, with each home using every bit of its square footage to provide an amazing living experience for the homeowner. All the living and social spaces on one level (bedrooms, kitchen, etc.). Many one-story house plans also include convenient laundry room placement, often connected to the kitchen or a back porch. As more people look into forever homes where they can live comfortably and happily in their golden years, the one story home plan is increasing in popularity among all age and economic groups. With the endless architectural style options and decorating possibilities at your fingertips, what’s not to love about this design? Browse our one floor home designs below.